Which 250 Companies Own the Best Single Word Generic Domain Names? Thies Lindenthal, from Massachusetts Institute of Technology, Center for Real Estate, Cambridge, MA, in the paper “Valuable Words: The Price Dynamics of Internet Domain Names,” states the following: “A domain name provides a virtual street address for any website or service on the Internet.”….” An appealing domain name like Apple.com is easy to recall and quickly entered. In this sense, an intuitive domain name is like a convenient down-town address linked to excellent transportation systems. 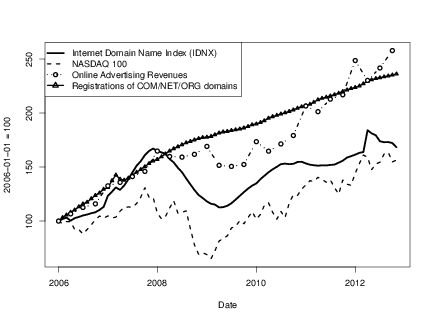 Long or cryptic domain names are more burdensome, which is comparable to a longer commute to a location somewhere in the outskirts.” The following graph, showing the price of domains vs the NASDAQ 100 is very revealing, as to the appreciating value of domain names. For these reasons, as well as many others on this site, Premium Category Killer Generic Single Word Domain Names are made available to select individuals or companies who want to take advantage of the power behind these names. We invite you to contact us if you are interested in any of the domain names listed on this site. THE FUTURE OF ADVERTISING IS ON THE INTERNET. HERE IS YOUR ONLY CHANCE TO OWN THIS DOMAIN IN THE .COM SPACE! Location, Location, Location. A powerful single word generic domain name is valuable virtual real estate in the digital world! What does your digital footprint say about you? Short Single Word Generic Domain names are easy to spell, and difficult to misspell. There are no single word generic domain names in the .com (dot com) extension which have not already been taken. Many corporations are placing one of their most valuable advertising assets, their websites, on domain names which in reality, don’t do them justice. People are usually not searching the internet for the brand name of a company! They are searching for what they need (such as a car, or a lawnmower, or a service such as a “gas station near me”), which consists of nouns, adjectives and verbs, but not company brand names, and not confusing website names. Pay Per Click Ads, which are powerful advertising tools that Google and Bing have mastered, cost the advertiser money each time a potential customer clicks on the ad. Why do companies pay big money to Google and Bing to advertise this way? BECAUSE IT WORKS! Google and Bing bring millions of customers searching for a product or service, such as “eye glasses,” to the websites of companies who offer that service or product. The problem with a company having a website with their brand name, is that it take a tremendous amount of advertising in order for people to recognize what they company is about. For example, Barnes and Noble started, years ago, as a very large bookstore in Manhattan, New York City. If someone in Los Angeles heard the name “Barnes and Noble,” they likely had no idea what the company did. Of course, the company grew to many locations across the country, and also developed a powerful website www.barnesandnoble.com. They spend significantly to always reinforce the idea and remind customers that they sell books. What if they owned the domain www.books.com or www.book.com ? Wouldn’t that help them tremendously? Well, they do, and it does. Barnes and Noble owns both of those names, and when you go to either of those sites, you are redirected to the main site barnesandnoble.com. Their visionary leaders decided to “own the future.” Owning a single word generic keyword is powerful, and a company can either build that website out, or redirect it to their website which already exists. When you see a business located on Watusi Street in a rural town in the Midwest, it may be a great business. When you learn the business is instead located on Fifth Avenue in New York City, overlooking Central Park, does a different image of that business come to mind? Of course it does. The same holds true with internet websites. 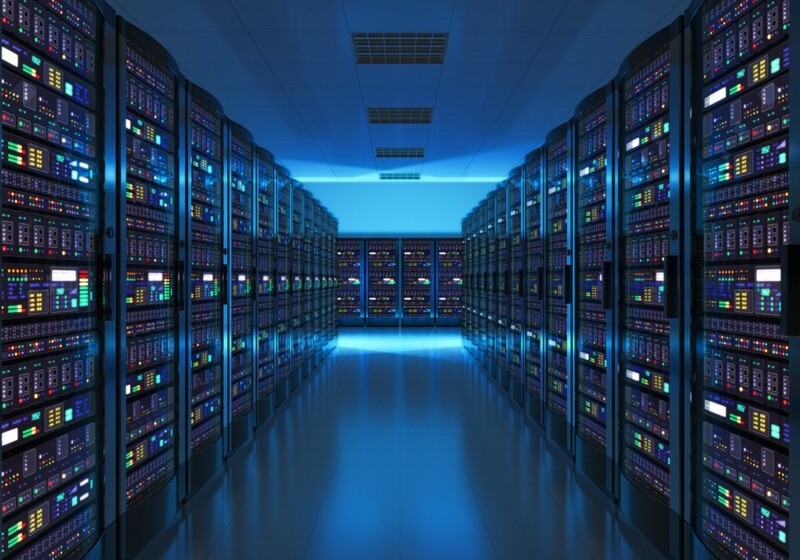 Your domain name is your “virtual address,” and domain names are “virtual real estate.” There is no doubt that everyone on the planet knows that owning a single word domain name in the dot com, is difficult to do, and associated with this comes the clout and prestige of a premium address in Uptown Manhattan, New York City. Location, Location, Location! It works in the real world! It works in the digital internet world. Your digital web address speaks for you, and it speaks about you. Only a few people will dominate the generic word space for their industry. If it isn’t you, it will be another company. Most companies have their own trademarked website, but this is not sufficient in today’s internet advertising space, because most customers search by terms which define what they need, rather than searching for a specific company. Think about it, there are tens, hundreds and even thousands of companies which compete to provide a service or deliver a product. Everyone knows this, but not every company will have the wisdom, insight, funds, and proactivity, to own their space. This speaks about the company, their leadership, and tells the world that they are a force to be reckoned with. If my book store name were ABC Books for Discerning Readers in the Midwest, and my website was www.abcbooksfordiscerningreadersmidwest.com, what would that say about my store? Even if I had a 200,000 square foot store, the first impression of my business by a casual observer would be luke warm, at best. On the other hand, if that same business owned www.books.com, I would immediately think that they were a dominant player in the industry, and would have immediate confidence and trust in them. Again, we congratulate Barnes and Noble! Having a category killer single word generic domain name allows a company to 1) capture additional web traffic by helping organic search, 2) decrease cost of Pay Per Click campaigns, but most importantly 3) owning a single word generic domain name allows a company to “own the space” with what is known as a category killer in their industry. Most consumers search the web using generic keywords, and owning critical keywords in the .com TDL (top level domain) is important to the growth and reputation of businesses, and this separates a business from its’ competitors. The human brain is very adaptable. Years ago, before smart phones, people had to remember their friends’ phone numbers. Now, we search for their name in our contacts, and the phone dials. The same is true with entering a domain in the URL bar of an internet browser. Single word generic names are easy to remember. The dot com space remains the dominant space. There is nothing easier to remember than a simple generic word in the dot com space. Again, we use books.com and book.com as an example, both owned by Barnes and Noble. Not only are single word generic names easy to remember, but the likelihood of misspelling them is low. There are websites which capitalize upon the mistakes of users, misspelling an intended name, and landing on the site of a competitor. With short single word generic names, the likelihood of this happening is low.